It was seeing a modified snowcat shuttle in Aspen Snowmass in 1965 that planted the seed for Canada’s first-ever cat operation— and all the dozens that would follow. Why can’t we indeed? It turns out we can—and for the last 31 years they have. Deep in the Selkirk Mountains, 1,800 metres above sea level and with terrain the size of Whistler and Vail combined, two groups of 12 clamber into two snowcats for the 9:00 a.m. powder departure. As we gaze out the slightly steamy side and rear windows, a scene of deep-snow wonder is gradually revealed. The mountain tableau is sublime—and it’s one that took the eyes of a geologist, the touch of a physiotherapist and the hearts of two passionate skiers to create. Some 30 years on, it’s still the life’s passion of Allan and Brenda Drury—and it shows. People here are evangelical about the call of the cat. This week, most of the guests are attached to one loose group, the godfather of which has been coming to Selkirk Wilderness for two decades. Members have collected over the years from Chicago to Boulder to L.A., making Meadow Creek, B.C., their powder mecca. The level of enthusiasm the guests have for the folks who operate the place have only one other possible source of competition: the skiing itself. And on this morning, it felt as if we had the pick of the best of the best. Meadow Mountain, our destination on a sort of massif that forms some of the principal terrain of Selkirk Wilderness, has a myriad of faces and 360 degrees of options—tree skiing, high alpine with big bowls and ridgelines, and chutes as steep as 45 degrees. Our ?rst run is on Rolling Thunder, deep roly-polies blanketed in knee-high, lighter-than-air powder. On Lightning Ridge, we ski a new area opened three years ago. Powder Surge is a blood-rush of trees, glades and bouncy pillows—600 metres of untracked vertical run after run. “We’re only working about 20 per cent of our terrain today,” says Heidi as we wait a few minutes for everyone to emerge from the glades and regroup on one of a network of cat roads that incise the slopes. Looking around, it seemed as if we could ski days in the same area without crossing tracks, all in that effortless and savagely fast dry powder snow for which the area was hand-picked. As the day went on, the powder seemed to get better and better. The rhythm of the five- or 10-minute cat rides up provided the perfect downbeat to the highs of the long runs. Snacks and drinks rotated and a tasty backcountry lunch was served in the cozy few square metres of delicious warmth and convenient conveyance of the cat. Heidi shared jokes and expertise. From her top technique tips (“Don’t sh** your turns, f*** them”) to a laugh that could advance global warming by a thousand years, she is a treasure the guests both respect and adore. Over dinner, one man recalled how a seven-month- pregnant Heidi once effortlessly yanked his helpless carcass from the depths of a tree well—one-handed. After skiing, everyone variously decamps to the outdoor hot tub, the pool table or the lounge. Santana and Janis Joplin waft through the lodge as guests mix their own martinis behind the bar, and beer and wine are lined up in the fridge on an honour system. “Having a bartender would change the whole atmosphere,” explains a guide methodically. It’s the atmosphere at Selkirk Wilderness that comprises the alchemy of the experiment. Three decades ago they put diesel in a snowcat, chugged up a mountain and skied down through the powder. Why? Maybe just because it beat walking. But now, a generation and a whole way of life later, there are so many other good reasons to do it, too. CAPACITY: Maximum 12 skiers per group, 24 skiers per week. 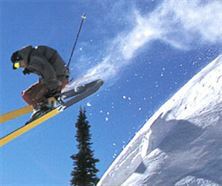 Two or three guides per group of 12 and deep-snow skiing instruction. PACKAGES: Packages include ?ve days of skiing, Monday through Friday, six nights’ accommodation (double occupancy) and all meals that begin Sunday evening with dinner and end Saturday morning with breakfast. Depending on snow conditions, you’ll ski 3,000 to 5,500 vertical metres per day (seven runs varying in length from 300 to 1,200 vertical metres). If requested, transportation is available from Nelson to Meadow Creek on Sunday afternoon, returning to Nelson the following Saturday morning. Prices from $3,190 to $4,140.